Here’s the moment you’ve all been waiting for- our picks for the hot sell-out holiday toys of 2018! This year’s list contains many more budget friendly options than in previous years, and many of the toys featured are similarly themed. We’ve added a sell-out risk rating to each item: 1 being the lowest risk of sell-out and 10 meaning that sell-out is eminent. Want to know when these are back in stock? Join our Facebook group! Nothing makes a parent more vulnerable to self torture than Christmas. We treat our budget like a free grocery store balloon, allowing it to raise higher and higher until it disappears into the clouds. We binge on sugar and fat laden foods, often eating fudge for breakfast and replacing dinner with eggnog and mulled wine. We somehow forget that our child’s slime obsession is pure torture, that we have been putting in our contact lenses with tap water, shaving our dry, un-lotioned legs with bar soap, have coordinated a full blown search party to locate the containers to store leftovers, and had to purchase an extra recycling bin to hold all of the empty glue bottles. But hey, it’s Christmas! 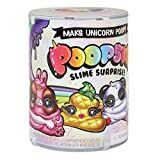 Your child LOVES slime, so why not take it a step further and add a slime pooping unicorn to the mix. The Poopsie Slime Surprise Unicorn is predicted to be one of the hottest toys of the year and is already sold out online. You can monitor Amazon stock HERE, and you may also have luck in-store at Walmart and Target. Your little Diva can’t be carrying around her slime collection in dollar store food containers. Splurge a little and get this Poopsie Pooey Puitton Collectable purse. This is currently IN-STOCK at Amazon, but has sold out at other retailers. 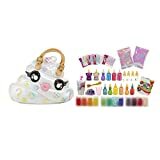 The Poopsie Slime Surprise Poop Packs can be used with the Poopsie Slime Surprise Unicorn, or on their own as a budget friendly option. With 18 different options set to release this fall, you can grab a few different ones. These are currently sold out at most places. Amazon currently has one option in-stock, but it has a back-order ship date of November 6th. You can still order, and if there’s a chance it will end up on your list, you should order it now. *NOTE: IN-STOCK NOW!!!! This is the first time in stock at Amazon in almost two weeks! Yet another product based on bodily functions rounds out the top half of our list of the hottest toys of 2018. The WowWee What’s That Smell? The Party Game That Stinks – Scent Guessing Game for Adults & Families has been sold out for a few days, but we expect to see it back in stock soon. The party game that stinks! What’s that Smell? is the hilariously fragrant guessing game that opens up a world of interesting whiffs. Guess the scents correctly to win or suffer the stinky consequences. Download the companion app to capture it all on your Reek Cam! Includes 50+ scents and comes with tokens, cardholders, 4 stank cards and a scorepad. The Little Live Wrapples are seemingly a cross between a Furby and a slap bracelet, which will make your 90’s pre-teen self scream with joy. These are available in four colors, and are already difficult to find. Wrapples are the cutest ‘Furry Best Friend’ you’ll ever connect with! Wrap them on your wrist and take them anywhere. They love a pat and interact as you chat, play and get carried away! Slap their ‘Slap-band’ tail on your wrist and take them with you! These adorable little friends have over 50 sounds and reactions! Watch as they come to life on your arms. Their big eyes light up to match their mood. Wrapples love to talk to you and to each other! They love to be pet and tickled. Hear them giggle and purr! Bring them close to each other and they will sing together! Hang them upside-down and they will go to sleep! Wrapples can’t wait to hang out with you! Every parent has thought to themselves ‘boy, my kids sure don’t yell enough- how can I make them LOUDER?”. Here’s your chance to crank up the volume! Yellies! by Hasbro are voice activated spider pets that actually move faster the louder you get. This is another cute, fuzzy, interactive toy to add to your list! It’s still available in many places, but the hype is really starting to build surrounding this toy. Meet the Lil’ Gleemerz — the adorable fun-makers with rainbow light-up tails and quirky sounds and phrases! The Lil’ Gleemerz are lighting up kids’ lives with fun and Friendship that positively glows! Amiglow is bright teal with big, glowing eyes and a furry LED light-up tail. While these aren’t one of the most popular and anticipated toys of the year, they have a very die-hard fan base and are only available in limited supply, which puts them towards the top of our sell-out list. These soft monsters come in many different styles, all with teeth that appear real (don’t worry, they aren’t- but you’ll definitely look twice). This STEAM centered Harry Potter Coding Kit lets you build a wand that actually responds to your movements. This looks to be a fun and challenging learning toy for ages 6+. ano community. The Harry Potter Kano Coding Kit is compatible with most iOS, Android or Amazon tablets, Mac and Windows PCs. After the unexpected and successful run of the L.O.L. Surprise Egg in 2017, L.O.L. has released the new L.O.L. Surprise Bigger Surprise in an attempt to return to the hot toy list, . This just started shipping on September 25th, so earlier reviews are written without personal experience. These cuddly, fuzzy, wearable pets will be at the top of every little girl’s Christmas list! Pomsies react to your touch in 50 different ways, and you can even feel them purr. Take your play to the next level with an interactive game of Freeze Dance. Grumblies are an adorable interactive toy that’s the exact opposite of it’s adorable cousin Pomsies. Provoke your Grumblie by rolling, poking, and shaking it to get it into full meltdown mode. There are 40 different reactions, and this is available in several different characters- each with it’s own personality and style. The Fisher-Price Imaginext Jurassic World, T-Rex Dinosaur is the perfect gift for a little dinosaur lover. Kids control all the action with this iconic Jurassic World T. Rex! Break the Jurassic Rex loose from the holding base and send her rampaging forward with awesome lunging and chomping action! This dangerous dinosaur has color-changing, light-up eyes that dilate and a mouth that glows red when she’s enraged! With a turn of the Power Pad, the vehicle launches out as Owen races after the dinosaur. Can he get the Jurassic Rex under control?